House Hunters Justin and Sara live in Baltimore, MD. They met online and have been married for over six years, Sara and Justin have two boys, Cameron (4) and Christian (7 months). The main motivation for their move is to find more space. As Justin says 400 times, he’s a space guy. 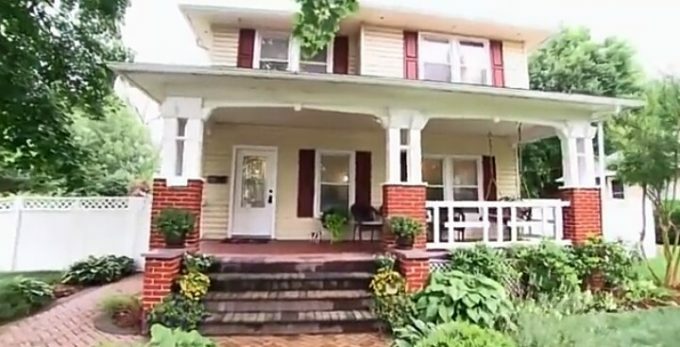 They’re moving to Frederick, MD, Sara’s former college town. Justin and Sara want space to entertain. They also want at least three bedrooms, and two and a half bathrooms. Sara and Justin also want a home with an open floor plan. Hers: Sara prefers craftsman style homes. His: Justin prefers colonial style homes. This home has four bedrooms and three bathrooms. It’s fairly large at over 3300 sq. ft. The home has a decent size kitchen, but not a gas range stove. Justin would want to remodel it. The place doesn’t quite have an open concept, but it has very high ceilings that makes it feel spacious. The master suite has plenty of space with a walk-in closet, and a separate shower and tub. The outside space has a nice, large deck and landscaping in the backyard. This home also has a finished basement with plenty of room for lounging. This over 2300 sq ft Colonial style home has four bedrooms, and three and a half bathrooms. It feels very homey with the nice great room, finished lounging basement, a balcony and fireplace. This home has a gas range stove with an island and other updated appliances. It feels very light and bright with large bay windows. The home has a jetted tub and a large master bedroom. It also has an extra room that could be converted into additional play space or storage. This home has four bedrooms and three bathrooms. It’s over 2300 sq. ft. This place has a ton of character, like the original hardwood flooring. It was built in the 1920s, so it has some remaining elements from that design, like a glass fixture on the doors from the original design. The home has a lot of cool quirky design elements, but it feels small. The master bedroom has a smaller closet than desired. The backyard is nice, but missing a garage. On the upper level, all four bedrooms would have to share one full bathroom, though it’s a nice one. Decision Time: House #1 had a ton of space, but Justin is frugal and doesn’t seem willing to chance it with that price. House #2 felt the most homey, but the balcony could become an area of concern with two small children. House #3 had so much character, but not enough space. Justin and Sara pick…House #2. They ended up buying it for the $460,000 asking price. Sara and plan to paint some rooms in the future, but right now they’re happy with the design.